Want to get into the Challenge Scene but don’t know where to start? Does it all look quite daunting? Want to prepare as best you can? Co-drivers, Want your driver to understand you? If the answer is YES to any of the above then we can do a training day to suit your needs. We run combined courses for driver and co-driver (to a maximum of 3 pairs). The courses are run by James Trembath, the founder of 4x4 Adventures Ltd. James is very well regarded in the Challenge Scene, in the past he has not only organised many Winch Challenge Events, but also attended and competed with success in many more including most of the "Big Names" in the UK. James is not a "theory man", he practices what he says, acting as co-driver for Nick Watts in the Rogue Vogue, in the 2009 and 2010 Howlin Wolf Series James (left) and Nick (right) coming 1st in Class, 2nd Overall. Further notable achievements include 7th in Croatia for 2011 with 2012 brining them 6th place in King Of the Valleys. In more recent events 4x4 Adventures had a 1st and 2nd place in 2013 Muddy Truckers and 1st at Mud Monster Yarwell Challenge Race in April 2013. Croatia 2013 a creditable 10th Overall and 2nd UK team. The Welsh Xtreme proved a better event for them with a 3rd place overall. 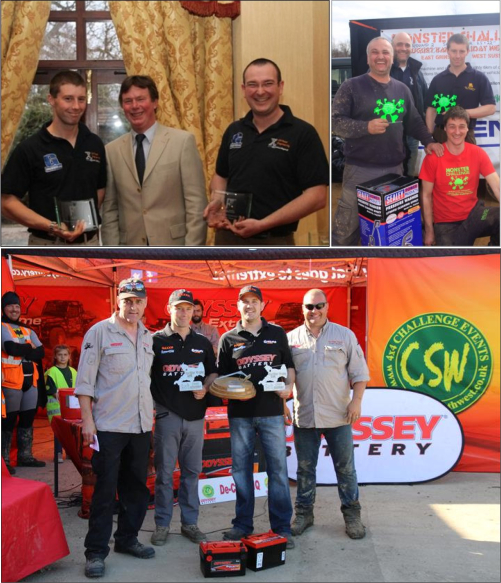 1st place at the Red Winch Challenge 2014, a top 10 finish in KOV 2014, 6th Place in Driven to Edge 2014. After discussing vehicle scruitineering, and planning your ‘competition day’ you will spend the day exploring the terrain where punches are likely to be located. The difficulty of the terrain is based on the level you wish to compete at. If a punch is found, you can tackle it at your discretion - one aspect of taking part in a Challenge Event is determining whether a punch is worth the effort/time. Before tackling any obstacle or punch you and your co-driver will have time to assess and plan your actions, advice on hand as required. All obstacles and punches are optional and can be bypassed. During the day you will encounter water, bogs, steep ascents and descents, side slopes - either as individual obstacles or combined. The following pictures were taken at one of our sites near Wellington in Somerset and give you an idea of some of the ground obstacles and terrain you will encounter. We know that with our experience and success in competitions and from our training experience we will be able to provide not only an enjoyable day out but also give you a new perspective on how to compete and do well. You would need to bring your own lunch and we also suggest a thermos. You may also want to bring your camera and some spare clothing. Challenge Training Days are either organised on "as requested" basis or published on the diary page, please note to attend a your vehicle must meet these requirements. If you have questions about the requirements or just want to find out whether Challenge Training Days are for you please do not hesitate to contact us.